The World Series was a big deal for everyone in the marine mammal group—most everyone in Boston, really. Even Amelia and Isaac shared their team spirit. 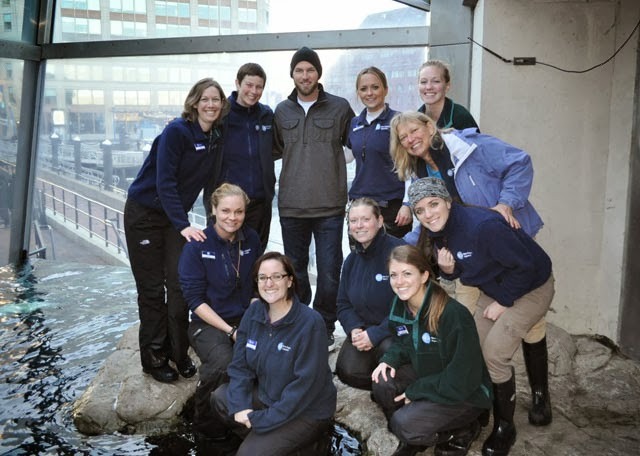 So you can imagine our excitement when we invited a member of the 2013 World Champion Boston Red Sox into the harbor seal exhibit! Stephen Drew and his family joined us to meet some of the harbor seals, learn about these animals and observe some of their skills. Reggae really showed off his flipper-to-eye coordination and leaping abilities when he congratulated the shortstop for his successes on the playing field. Just watch. Way to Reggae and Boston Red Sox! What's a Flurkey, you ask? Congratulations to the home team!